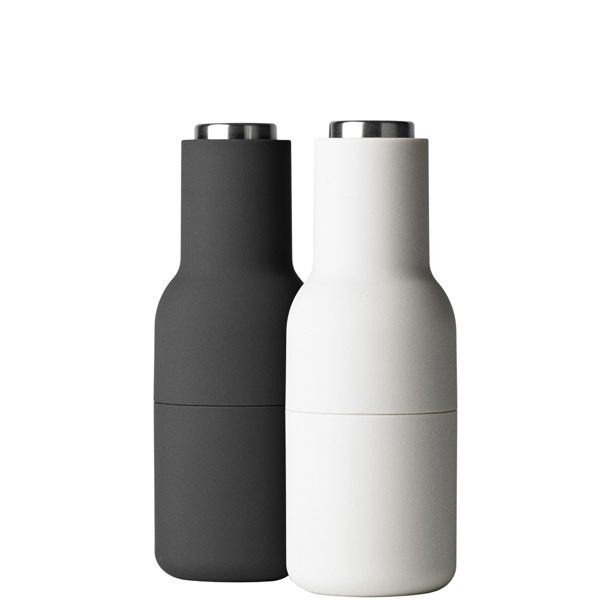 The Bottle grinders, designed by Norm Architects for Menu, are an innovative take on traditional spice mills. They come with a powerful ceramic grinding mechanism that is located conveniently on the top part of the mill – you don't have to worry about the grounds spreading on the table. The simple, bottle-shaped design is fun, unique, and looks great in any kitchen. 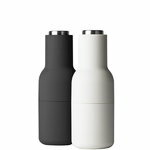 The set includes two Bottle grinders in different tones, perfected with steel adjustment knobs. The grinders have a silicone coating that is easy to clean and provides a good grip. Menu recommends that after emptying the grinders, cleaning is done with lukewarm water mixed with soap flakes while using a soft sponge. Please make sure the grinder is wiped off with a clean damp cloth and thoroughly dried off before refilled with salt/pepper.